Among many great works this Symbolism painter produced, the most famous one is of course "Scream". 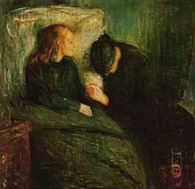 I don't know why, but, for me personally, this painting "The Sick Child" is the most interesting one. It's a captivating moment of grief. The sick child is his sister, suffering from a fatal tuberculosis, and the woman is said to be her aunt. Surprising thing about this painting is, the woman seems to be more distressed by young girl. Her face seems somehow to have given up her hope and resigned to her fate. It's a punishingly sad moment painted really beautifully. Munch's life was full of sickness, sadness and madness. In that sense, he had a tormented life as Van Gogh did. Both of them spent time at asylum, although Munch recovered from it and lived a long life after that. This YouTube documentary is a short but concise introduction to his life and work.